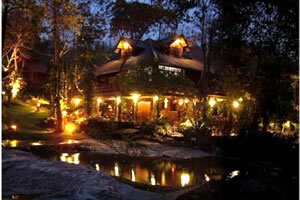 Pictures and location of Sukantara Cascade Resort in Chiangmai Thailand. Detail description of the hotel, facilities, maps and location. => Read reviews about Sukantara Cascade Resort. Sukantara Resort lies on the sloping bank of a mountain stream in the verdant Chiangmai highland. Mountain water cascades over boulders in the stream, creating tiered waterfalls right below the Lanna-Balinese-style guest cottages, which are surrounded by breathtaking landscape. The resort offers the blissful experiences of close-to-nature living, that will remain a cherished memory for a lifetime. The restroom closes to the nature in open-air style. Bathroom and toilette are separated comfortably. All of decorating furniture had been made by native craft man using local designs and materials. Therefore, Sukantara guestroom with deluxe appointment contains first-class amenities for every comfort. Suite Pool Villa :This Villa is magnificently designed and utilizes perfect space planning to enable you to really enjoy privilege luxury lifestyle along the beautiful cascade stream. Twin Lanna Cottage is 2 Deluxe Lanna Cottages which are connected by big balcony together+ Jacuzzi outdoor. Deluxe Lanna Cottage is designed with Balinese and Lanna style, which is created in line with nature environment. Every cottage structure collaboratly made of wooden with Lanna style- high ceiling, which is surrounded by beautiful cascade and tropical forest scenery.